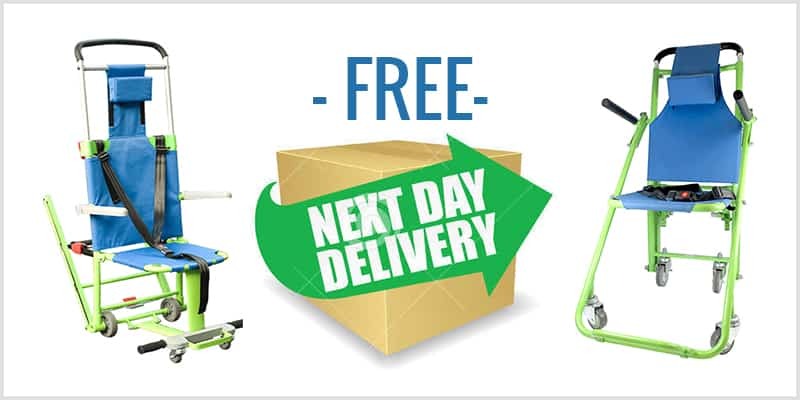 FREE Next Day Delivery | Evacuation Chairs | Evacusafe UK Ltd.
Evacusafe > News > News > Where Can You Get FREE Next Day UK Delivery on all Evacuation Chairs? In a market where the foreign exchange rate is often passed on to the consumer, UK based Evacuation Chair Company, Evacusafe, has always strived to keep its prices at a market low without compromising on build quality. Reacting to the UK Evacuation market requirements, Evacusafe UK can now dispatch their bestselling Excel and Standard Evacuation Chairs, for next day delivery to any address in the UK. Furthermore, this service is completely FREE OF CHARGE and therefore costs the customer absolutely nothing. Tony Gill, Director of Evacusafe, said “Whilst we have seen industry competitors hike their prices and delivery charges in recent months, to keep in line with a lower exchange rate, this, we believe, is a unique service offer within the UK Evacuation market and know for a fact that it appeals to all of our customers, old and new”. For more information about the Evacuation Chair Excel model click here, and to find out about the Standard Model click here. It’s also worth noting that buying direct from www.evacusafe.co.uk/ automatically saves 5% on all retail prices, therefore passing on even more savings to the customer.